The good news is I’m feeling much better! The bad is now hubby has the cold. :-( And I’ve got a messy house and long to-do list for the weekend thanks to the not-so-productive week. Oh well, I’ll feel miles better after getting things under control. 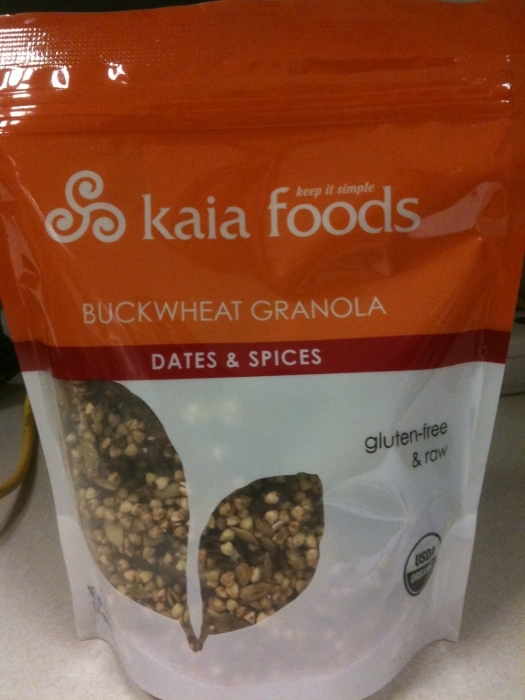 Yesterday I tried a new snack with lunch – Kaia Foods Dates & Spices Buckwheat Granola. I rarely buy products this pricey, it was an impulse buy at Whole Foods that I thought would be good to have with salads for at work desk lunches. 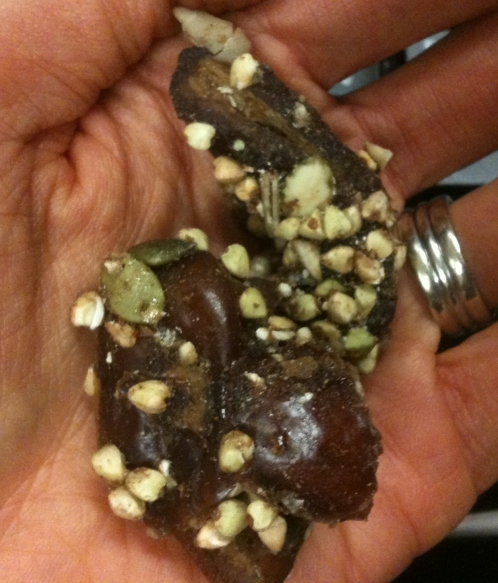 The bag contained a lot of date halves covered in seeds and buckwheat with a spicy, nutmeg/cinnamon flavor. The date chunks were good, but very tough and chewy – not recommended for sensitive teeth and dental work! 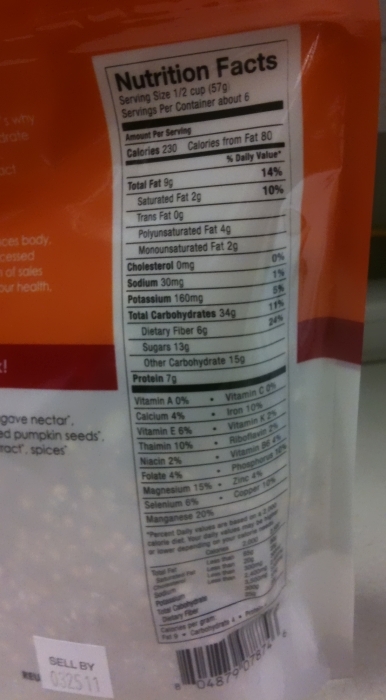 However, there weren’t too many of the date chunks, the rest of the bag was loose buckwheat and small walnut chunks that were messy to eat as a snack and would almost have to be eaten as cereal. It wasn’t bad, but I can’t say I’d buy this flavor again. After work yesterday, I ran to Costco to load up on another 10 lb. bag of organic carrots, watermelons, organic spinach, etc. But it was an annoying shopping experience because I was tired and cranky from being sick and not sleeping well and the store was packed. Even getting into the parking lot was a patience-trying experience. Buy the time I got home, I was wiped and hubby was already coming down with the cold symptoms, so we opted for a relaxing evening at home. 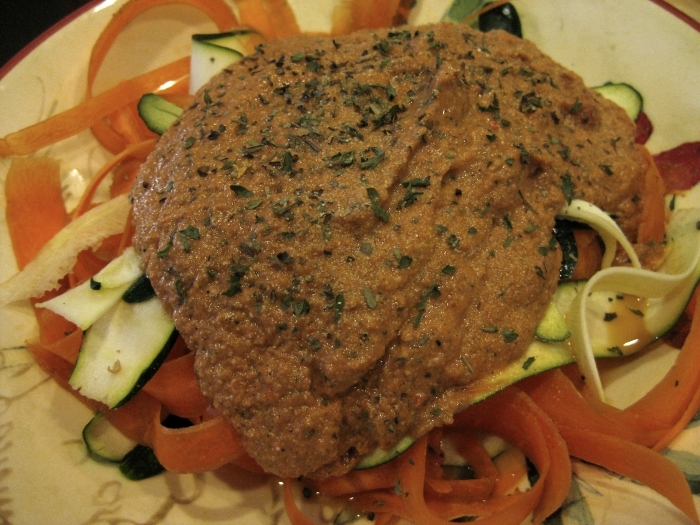 I made raw marinara sauce to top zucchini and carrot ribbons – I was too lazy to get the spiralizer out then have to wash it and the last batch of zucchini I got was really too small anyway to spiralize. 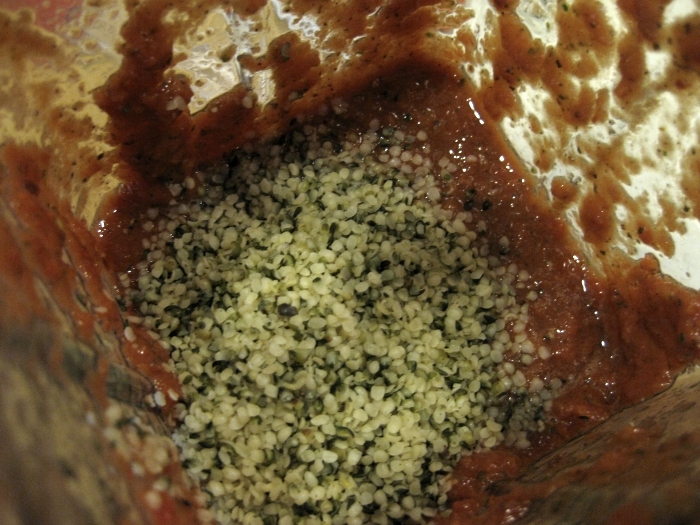 To thicken the marinara and add protein, I added a carrot and 1/4 cup of hemp seeds into the Vita-Mix. The end result was very good with a thicker texture and heartier flavor to the sauce. It actually made a good, well-rounded dinner while still being quick. I’m still going on my reduced-nut experiment, almost 3 weeks now of skipping whole raw cashews, walnuts and many other nuts and my skin is much better. I’m sad that eating a lot of them causes this reaction on me, walnuts are one of my favorite snacks. But I’ve learned a lot while trying other sources of protein – like too many beans causes heartburn and other digestive stresses for me, hemp seeds agree very well with me in any form and tempeh is a good source of vegan protein for a quick stir fry. What is you favorite quick dinner to whip up? What foods give you a bad reaction? i have never puchased kaia b/c of the price. I have not been given it free, either LOL but i dont think i would ever buy it…basically date chunks and a few seeds sprinkled with cinny. 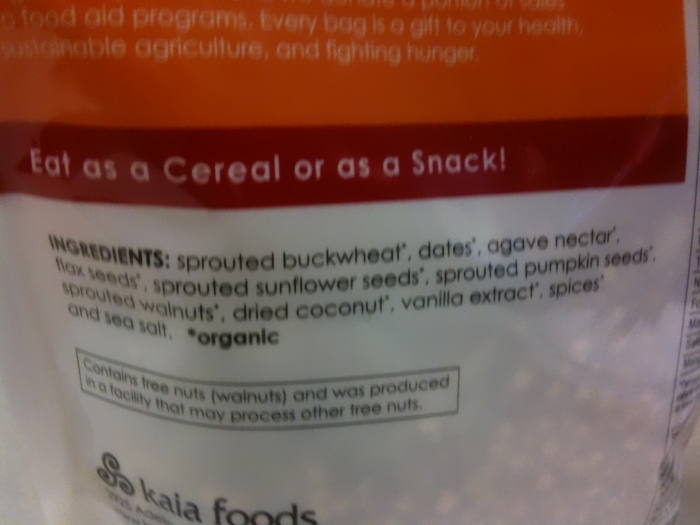 Good but i can recreate that type of “trail mix” or broken up bits of granola on my own. Thank you for your honest review…refreshing! Costco. I have a membership but NEVER go. B/c of the experience you described. Try that same thing, with a 3 yr old in hand. CAr seats, parking lot walks, too much to grab and noodle around with & makes for a very taxing trip. Not worth it to save $5 bucks on my overall bill type of thing. I want to love costco…i just am not there…. the nuts..yes, the are fairly hard for the body to break down and toxins are released and some ppl that’s the skin. Sorry to hear this is your situ. But glad that you’ve figured it out! auhhhhhghhhh this looks SOOO good. Glad to hear that you’re feeling better but I’m sorry that your hubby’s got the cold now.. Hope hegets better soon! The raw pasta looks fantastic! I love the Kaia foods granola. The cinnamon raisin definitely is good! The dates are definitely a bit too chewy for me but otherwise I love that flavor.